What’s that you say? You wish you had a brand new paper doll to play with? And you wish it would reflect your interests… Or, dare I say, your unhealthy obsessions? Am I talking to you or talking into the mirror? It doesn’t matter because I just wanted to let you know that we have once again cooked up an entertainment doll that the whole world didn’t realize it needed until it clicked into this post! That’s right. Your eyes aren’t deceiving you. 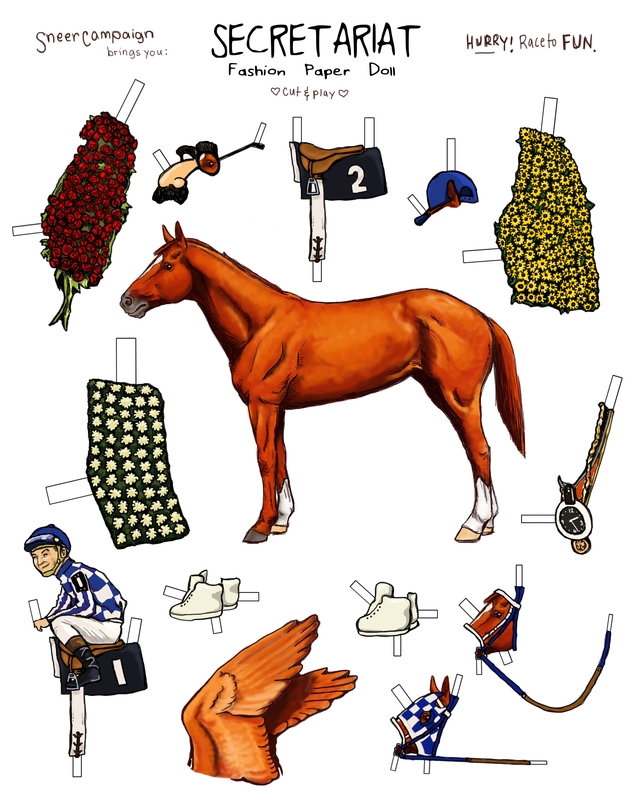 We have brought you a Secretariat Paper Doll! Traditionally, these sorts of dolls are fun because you, the child, get to experience the joy of dressing up a human form in fancy clothes. But we are renegades on this site, not bound by convention. We see the world through the clear, almost unsettling lens of the iconoclast. Secretariat is a STAR and you will be pleased to dress him in the fine styles that we have provided. On the page that you will need to print out, you can find such dazzling items as a matching bridle and racing saddle set. The blue checkered hood and blinker bridle makes an appearance, and is there anything that screams “trendsetter” more than a whole-jockey accessory? Included, you will find glamorous flower fashion shawls by such designers as K.Y. Derby, Preakness, and Belmont. Secretariat wore them all. And he looked STUNNING. There are also a few miscellaneous items for use when you are feeling a little silly. Secretariat was not all business all the time. He retired when he was only four years old after all, so he had decades of goofing off. The giant horse head sized novelty Groucho Glasses represent his fun-loving side. He was often seen wearing them when he had a few too many sugar lumps. Also included are his sideways cap, outrageous necklace chains, and totally funky fresh sneaker shoes: his preferred style while trotting the streets. Finally, you’ll no doubt recognize the glorious angel wings (which you are to cut up along those little white lines and sort of slide onto his back, theoretically. If that doesn’t work, just use chewing gum or something) from And Here Comes Secretariat. These should class up your shrine very nicely, as angelic beings typically bring a taste of High Quality to any event. Click on the image to go to the real size and print it on out.